This compilation is a thought-provoking, “big picture” view of the digital state. 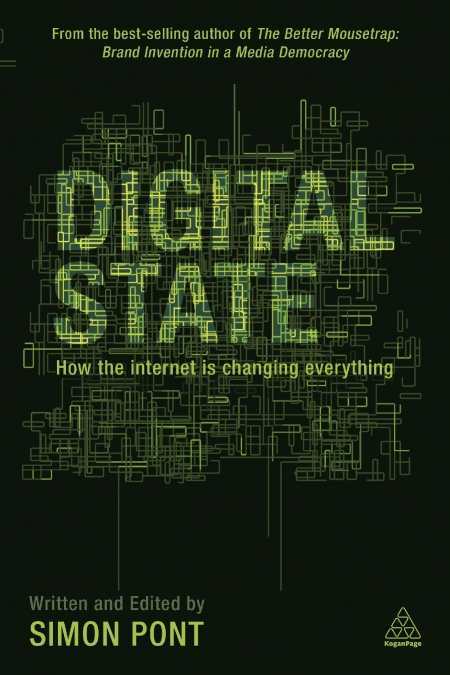 Digital State: How the Internet is Changing Everything, written and edited by Simon Pont, is an anthology of sixteen essays tracking the evolution of the Internet, and what it has meant in individuals’ lives, and for society as a whole. Pont, also author of The Better Mousetrap: Brand Invention in a Media Democracy (Kogan Page, 2012), pens three of the essays, and the remainder are each written by different writers with a unique perspective on digital media, many from the fields of marketing and advertising. Topics include whether the Internet is having a positive or negative impact on society; the future of digital media; why marketing efforts need to adapt to the changing expectations among digital users; how the Internet is being used for activism; and legal issues, such as copyright, defamation, and privacy. Providing a “big picture” view of the digital state, the book is not a how-to or practical guide offering specific advice about how to use digital media, but rather takes a philosophical and theoretical approach to defining and analyzing “the digital state,” drawing on concepts from Hegel, Heidegger, and McLuhan, as well as contemporary popular culture examples, such as television shows, books, and popular brands. Pont introduces each essay, relating how he met the authors: Some worked with Pont at advertising and communications agencies; others work in journalism, law, and civil engineering; and one contributor is his brother, senior vice president at the investment firm PIMCO. Pont’s interjections personalize the book, provide context for the essays, and establish the writers’ backgrounds. They also give the book a conversational and friendly tone. The information will appeal primarily to marketing and advertising executives — anyone building a brand and seeking to maximize the capabilities of digital media. The broadview, theoretical approach will also appeal to scholars studying new media. A unique aspect of the book is that Pont is so transparent about the process of putting the anthology together, and his deliberate decision to use contributors rather than writing the book solely from his own perspective. He explains that he wants the process of exploring the topic of the digital state to be collaborative, reflecting a common theme discussed in the essays, specifically, the collaborative nature of the Internet. While the essays are very personal, written from the writers’ distinct viewpoints about their experiences with digital media, the book is cohesive, with a thought-provoking, unified theme emphasizing how the digital state has changed so much in just a few years, and how it will continue to change in the future.